Can this top work three ways? I’m a three-way girl. In my fashion book, there have to be three ways of styling one single item. He was right. I got so much relief from broadening my mind to come up with multiple solutions. I took this lesson into how I work with clothes. Call me prudent, but I believe any new item should work three ways at a minimum in order to earn that little piece of real estate it’s going to take up in your closet. 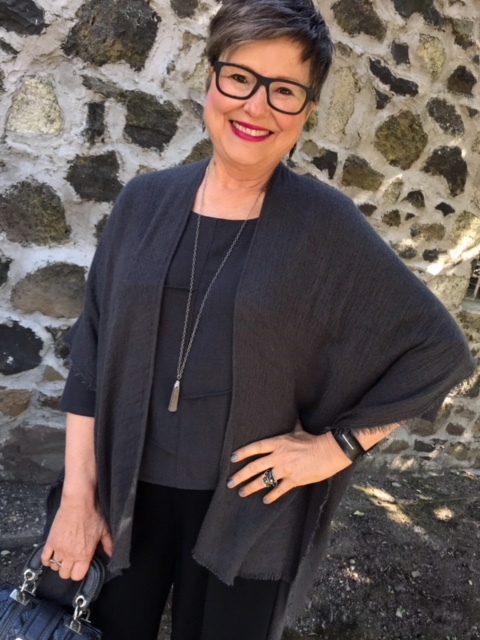 Case in point: My recent acquisition from Artful Home, a charcoal gray Renzo crepe top by Lisa Bayne. I chose it from an image in the Artful Home catalog. I was very attracted to the color. As you well know, shades of gray are great on me. This top has 3/4 sleeves and is hip-length. I’ve been looking for tops that aren’t too huggy around my tummy. I had a date with my girlfriends to grab a bite to eat and solve world problems at Farm House Local in Larkspur. (I recommend the Huevos Rancheros.) I put the Renzo top on over a black tank that hung lower than the top. I wanted the tank for warmth. That layering piece blended into my dark indigo flared Kut from the Kloth jeans. I wore my trusty cowgirl boots. Since it’s been chilly, I looked through my scarves to help me keep my neck warm. I felt a strong need to wear this wool gray and black leopard print one. Isn’t it fun? By having that luscious wad of fabric near my face, it actually made me look taller! That’s because the scarf extends the line of my outfit. I bet you didn’t know a scarf could make you taller, right? See the clever stitching detail and the pretty neckline? Not too high, not too low. I enjoyed feeling snuggly with the scarf around my neck. When I pull it away you can see the great detailing in the top. I accessorized by adding interesting bracelets to my wrist. One of them is a horn bracelet with two bands of tiny diamonds to anchor it. The other one is by Pat Flynn. It’s his iron cuff with diamonds from Artful Home. The two bracelets are both elegant and organic. I love the color of them with the charcoal top. I added my arty ring to the mix. I loved every chance I had to gaze at these two bracelets while not being able to solve world problems over lunch. Warning: Baby pictures ahead which means I need you to remember to come back to this post and finish reading it to the end. Although I too wanted to spend the day staring at Baby Owen, you need to see how I’m styling this top for a different lifestyle activity: working with my precious clients whose grown-up children (also my clients) become parents for the first time. Meet two-week old Baby Owen. I was warned but Baby Owen didn’t spit up on my Renzo top! 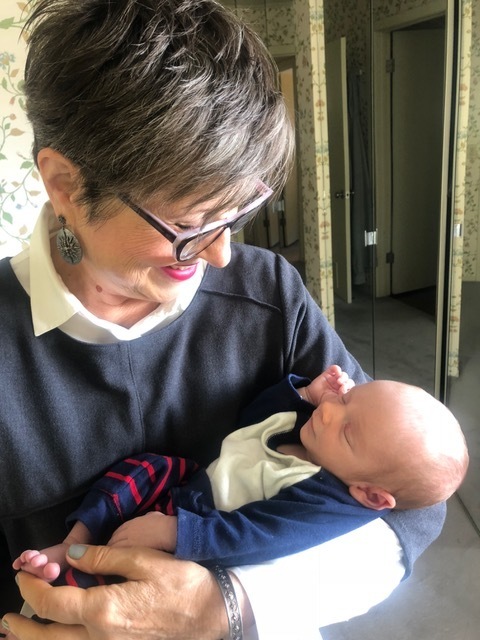 How’s a style and wardrobe consultant going to help Gramma get into some transition outfits for spring with Baby Owen in my arms? This is one of the perks of having a long career working with the same clients. Oh, joy! 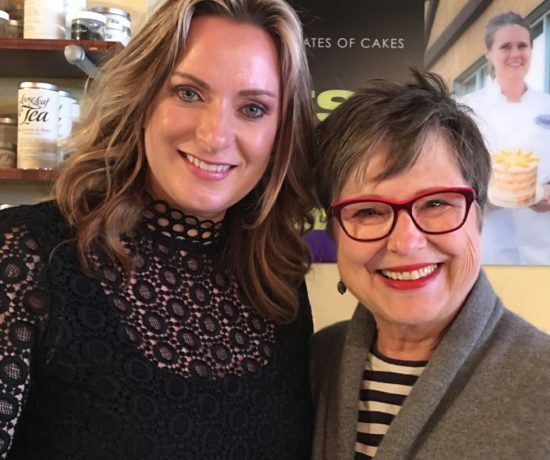 Meeting my third generation client for the first time! Okay, baby gazing time is over. 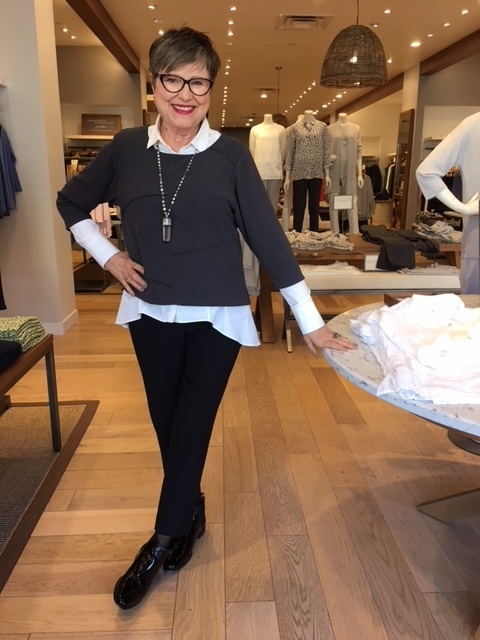 Now let me show you how I worked this charcoal top into a work outfit. 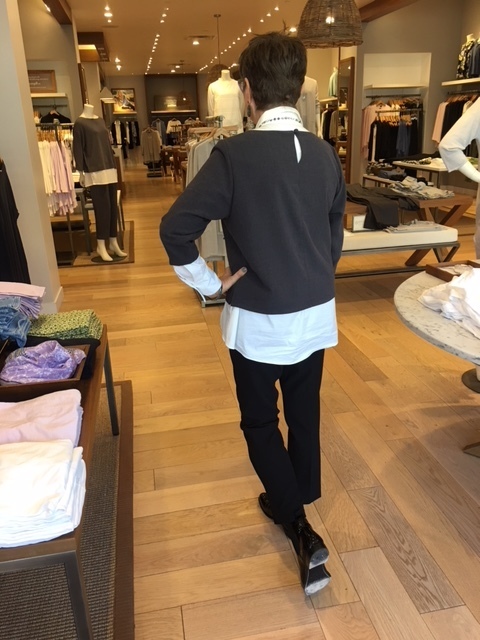 I like to have a polished look when working with my clients for home closet visits or when I’m out shopping with them. So that morning I started putting my professional look together using the Renzo top. I started with my black Theory ankle pants. I wanted to see if I could layer the charcoal top over a high/low white blouse. I love the classic color combo of black, gray, and white. I scored this blouse at my daughters’ consignment store, SAX Consignment. It’s by Brunello Cucinelli. I added charcoal earrings and my crystal pendant with light colored stones (homemade). 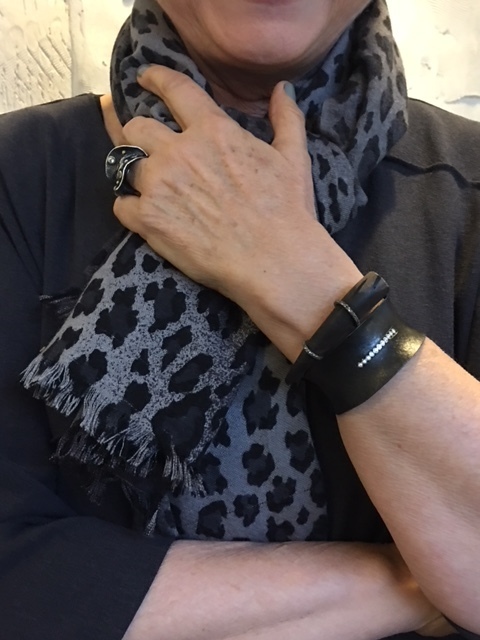 I added a thin charcoal bangle and my arty ring. I put on some tightly woven black fishnet knee-his and my black patent boots by The Office of Angela Scott. When this day started, I actually wasn’t expecting to be shopping with my client. Erin and I were there in her home to style new outfits for this sliver of fashion transition time between winter and spring. Remember my 5 lightening and brightening tips? That’s what we were up to. But while we were in the closet working with her wardrobe it became apparent that she needed more than jean jackets to help her transition her wardrobe. We decided to run to the mall and check on a couple of jackets she could start wearing soon. I love the detail of the keyhole closure in the back. 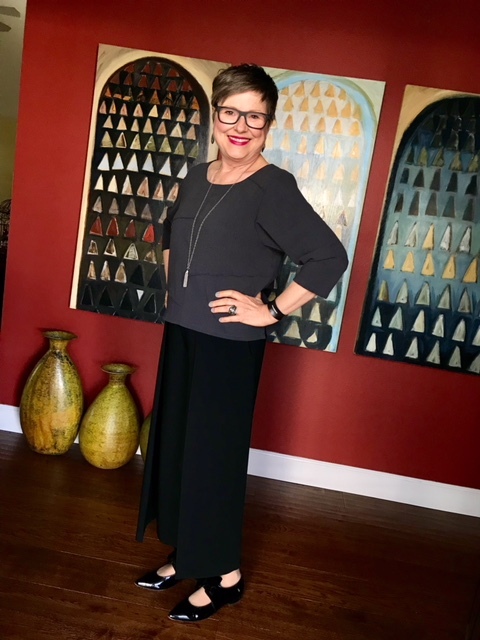 Okay, I’ve worn the Renzo crepe top to lunch with my gal pals, to work with my precious clients, but could I dress it up for a lovely date night with Russ and enjoy looking at his brown eyes over candlelight at a corner table in a nice restaurant? Well, let’s just see. In dressing up the Renzo top I didn’t want a collar, too formal. I did need another layer (chilly, still). I looked in my closet for other gray things. Gray on gray is elegant. When I spotted this gray Echo shawl I knew I had a big piece of the outfit completed already. 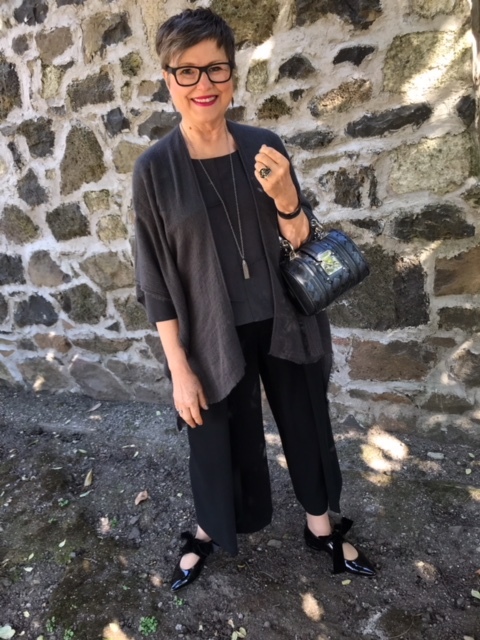 The shawl extends the length of the top and flows into the wide-leg Rag & Bone pants I chose to wear. I added my Pat Flynn iron cuff with diamonds to keep the elegant theme going. So the diamonds in the cuff could have a playmate while Russ and I were cooing with each other, I added this simply elegant tassel necklace with sparkles. This outfit called for my pointy-toed patent AGL flats with big velvet bows. I love when perfect mating happens spontaneously in your closet. The texture and flat weave of my shawl is only perfect with the texture and flat weave of my top. The fact that they’re so close to the same is what gives this an elegant look. 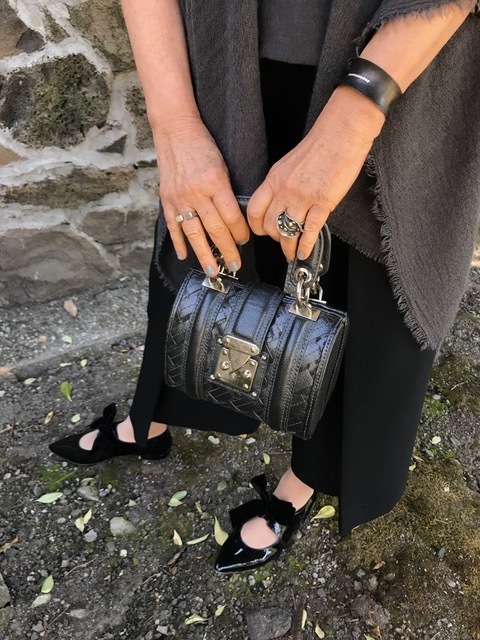 I’m adding a different texture for added interest with the iron cuff and the sheen of my framed charcoal gray artistic handbag. I really love the way this came together. How I feel in this outfit is exactly how I want to feel on date night. Dad would be proud! I did indeed come up with three ways to wear this top. I think I get extra points for the fact that I managed to wear it for three different parts of my life. What do you think about my prudent three-way styling rule? Do you have a different formula that works for you? Do share, my friends! This post is sponsored by Artful Home. 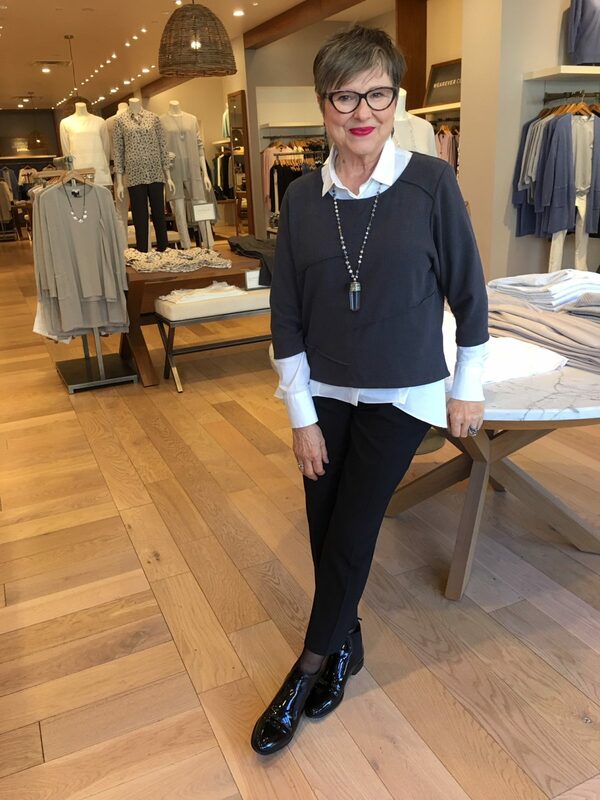 You can find the Renzo crepe top by Lisa Bayne in charcoal or Jasper in the winter collection right now. 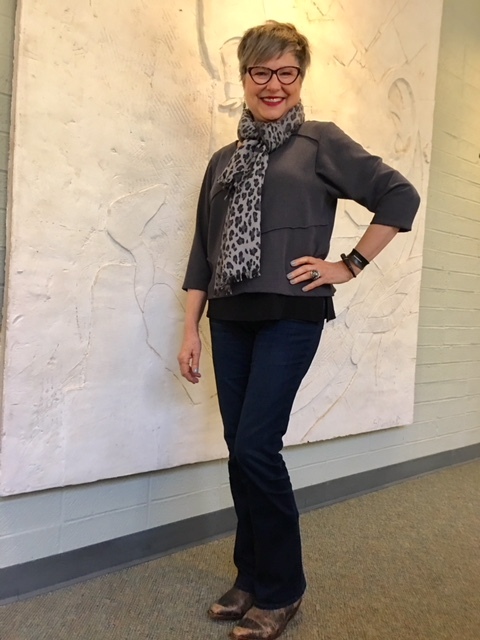 Thank you Artful Home and Lisa Bayne for gifting me this top and letting me use it to demonstrate my three-way fashion styling tip. Funny! Thanks for pointing that out! Lately I’ve been tossing rules out. Probably why I own too many things that don’t get worn and now I’ve outgrown! I’ve been gazing at how to change things up looking at spring outfits. I have a hard time seeing possibilities and am hoping to get more creative with my clothing. At soon to be 62, I want to be more flexible and open! I do like the top and kudos fog being so creative! I especially like that baby! How much fun…smelling the scent of youth and newness at work! Everyone needs that! 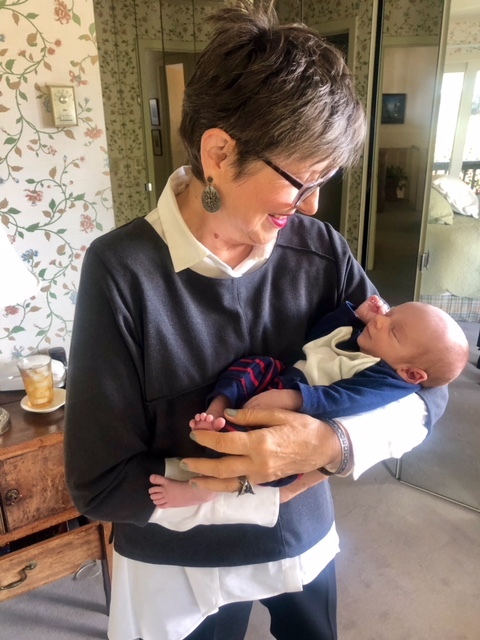 Yes, Kathy, I may have to insist that every time I go to that client’s house she arranges to have the baby there! “Flexible and open” are two great things to be looking at in our 60s! And those qualities really change how we look at clothes. Great post ! I’ve been thinking about my spring wardrobe. I recently lost weight so I’ll be needing a lot of new items. I will use the three way idea when looking for new pieces. That’s an excellent tool to use while you’re shopping. Have fun! Inspired! As always. Many thanks, Brenda. Thanks Brenda. I have a knitted top that I haven’t worn much and is a similar style. I am inspired to use your ideas to style it. That baby is adorable! Just look at those teeny, tiny feet. And your mannequin twin is quite hilarious. I wouldn’t have noticed that if Melissa hadn’t pointed it out. But now about fashion, I love your three-way styling rule. I’m going to look at the contents of my closet with that in mind and perhaps find some new ways to wear old favourites! Sounds like a great plan, Elaine! 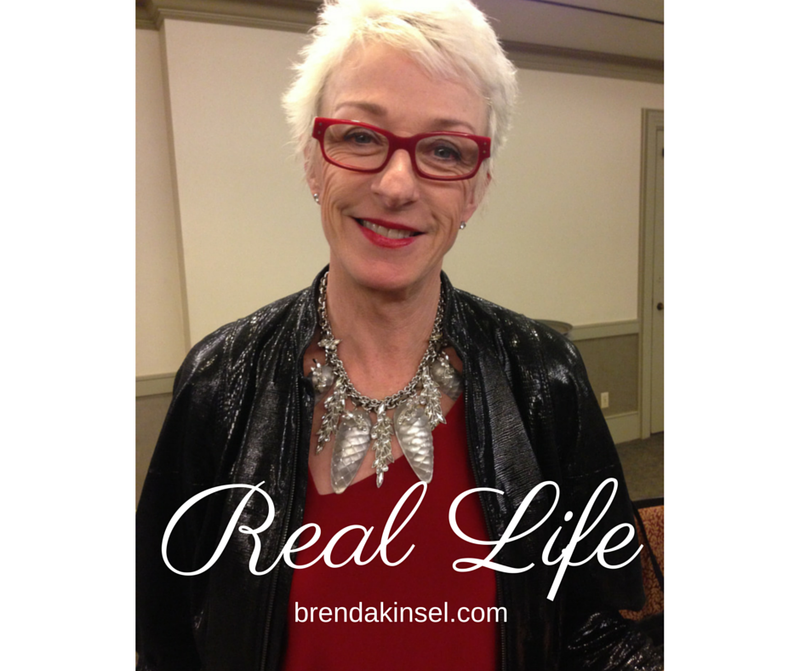 I love the picture of “Brenda at work”. Why was my job never that much fun? Brenda, this is a very useful post and it has made me realize that I don’t get enough flexibility from my clothes. Once I find a way to mix pieces that I like, I always wear them that way until they wear out. This spring I am really going to try to find at least 2 ways to wear everything (not 3, since I don’t want to become discouraged). If I’m successful, I’ll try for 3 ways later. Not that you ever seem to need suggestions, but if you would consider a similar post (1 item worn 3 ways) sometime soon, it would be helpful. Thanks for putting so much effort into this blog. It is greatly appreciated. Thanks, Cathy. And I really appreciate your “ask” for another piece on this subject. As soon as you said that I thought, Wow, what a great idea! So my brain is collecting ideas. Happy to serve!! And so happy to have you as a reader! I got this one at Nordstrom but lots of stores would carry it too: Bloomingdale’s, Neiman Marcus, Saks Fifth Avenue. All the major stores for sure. You are so clever ! I love how you styled this!! I love all the accessories . You are the master of accessories!! Thanks, Cindy! I was wishing I could channel you as I helped Erin with her apartment this last week. She asked for my help and it was fun to spend her money. Hugs to you! Yes!I read it thanks to Instagram reminding me! Instagram is great that way! 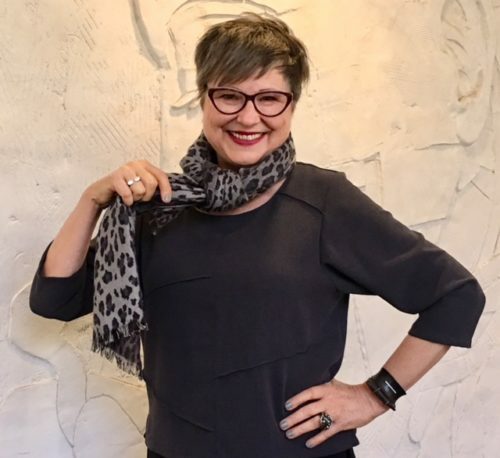 Brerda, what I love about your fashion blog and pictures……..you are always smiling and looking like life is such a pleasure. Most fashion pics are far too serious in my opinion. The best accesory is a smile! Thanks for always looking so wonderful! That’s very kind, Marie. Yes, that serious pics won’t be mine. I’m usually getting someone to snap pics in five minutes but that’s life and I’m just glad it all comes across the way it does. Life is a pleasure. Sure, I get into funks from time to time but mostly I appreciate each day. I am new to your blog and enjoy reading it. Your photos are so helpful. I notice that you don’t wear a watch. Is there a special reason for this? Glad you found the blog. Actually, I do wear a watch every day! They must not be showing in the photos.